Waste is a major problem for restaurants of all sizes across America. Research has shown that the average restaurant can produce 150,000 lbs. of garbage a year. This doesn’t just hurt your bottom line — as every ounce of food thrown away is a combination of ingredients you paid for — it’s also a major issue for the environment. Modern consumers are looking for businesses that are thoughtful in how their carbon footprint affects the world around them. If you can build a reputation for green practices, it can mean big things for your brand — and have a big effect on your revenue. In particular, consider looking at your take-out, to-go, and delivery containers. If you do a lot of take-out business, you might be surprised how large an effect simple changes like switching out the kinds of containers you stock can have. Small steps can have a big impact and help your restaurant be more environmentally friendly. The first step in becoming more green with your take-out boxes is getting rid of any Styrofoam containers you order. Styrofoam is non-recyclable and causes major issues for the environment. In fact, some areas of the US already have restrictions for Styrofoam use in restaurants. Replacing it with better, more eco-friendly options on your own can be an important step for reducing your business’ carbon footprint. Consider recycled (and possibly recyclable) paper products and cardboard. Paper containers that haven’t absorbed food residue can be recycled by your customers after use, but even containers that can’t be recycled will still ultimately decompose. Aluminum is also a more environmentally-sound option than Styrofoam, since it can be easily re-melted and, if left to decompose, will eventually oxidize without releasing harmful pollutants. Of course, the newest trend in take-out options is biodegradable containers. These containers are made from the agricultural byproducts, specifically starchy fibers of plants like bamboo, sugar cane, rice pulp, wheat, and corn. The idea is that these containers can be used in compost systems or will naturally biodegrade over time even if it makes its way to a landfill. These containers aren’t a perfect solution — it still takes energy and resources to make them, and they aren’t recycled in the same way plastics and paper are. But in terms of new alternatives, this has a lot of appeal with eco-conscious consumers. Assume that everything on your menu will need to be wrapped up for a guest to take home at some point in the future. This is especially true if you offer delivery. Keeping a few different sizes and shapes of containers on hand will help ensure that any item can easily be taken home. No matter what material and brand you choose for your containers, make sure to check reviews from other businesses on how sturdy they are. Think about how many of your items have sauces or soups. You want sturdy containers that are liquid resistant. It does no good to get environmentally friendly products and then double down when putting in the leftovers (or risk the contents spilling all over your guests on the way home). Also remember that not all items will be cold or room temperature. If you have pick-up or delivery options, make sure the containers have enough insulation so they don’t burn the person carrying it. Again, how easily the containers degrade is a big part in going green with your take-out. Make sure to keep that in mind as you weigh your options from a durability and usefulness standpoint. 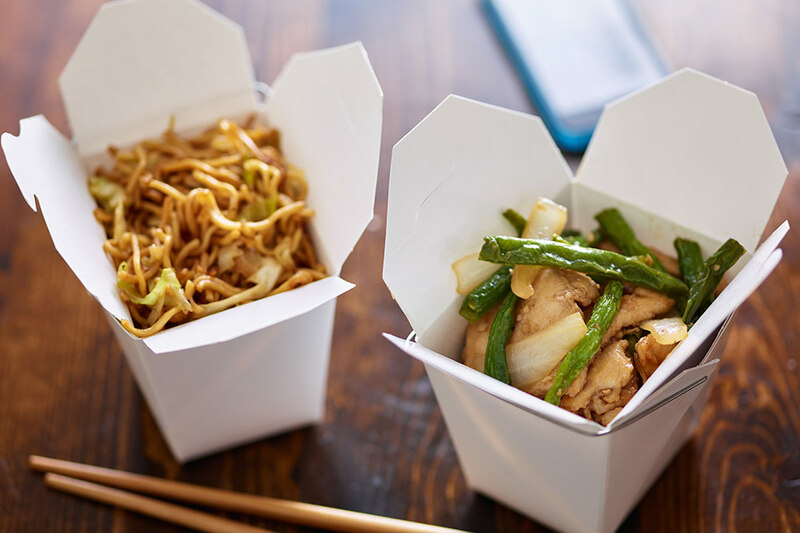 One more tip to help conserve when offering take-out: when taking a delivery or pick up order, specifically ask if they want to include utensils and napkins. Every time the customer lets you know they don’t need utensils or napkins added, it will help you be more conservation-focused, not to mention saving you money on utensils that wouldn’t be used. On top of that, many delivery customers appreciate being asked, so they’re not stuck with extra utensils cluttering up their space. Need some other ideas about how to save — and make — more money with your menu? Download our free eBook “Menu Magic: How to Increase Your Restaurant Sales” now!